The article also notes that "there’s little research on whether... transit riders feel more connected to their communities." But there is work on that topic, such as the "Are we there yet?" 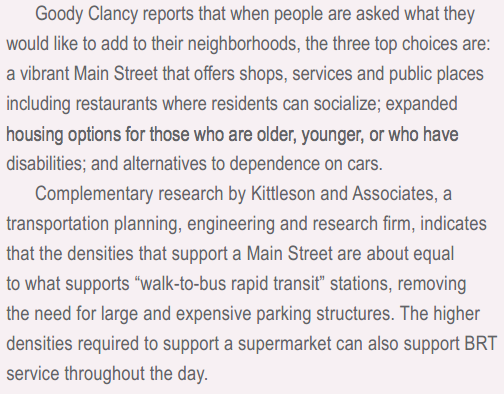 report issued by Reconnecting America mentioned here recently, which cites access to public transportation as one of the key elements in creating stable communities. Granted, that report was in part funded by the American Public Transportation Association, but it also drew support from the Ford and Surdna Foundations, philanthropies interested in sustainability and social change, respectively. It is not hard to imagine why people might experience a transitive connection to place via public transport. We are very familiar with our emotional attachment to cars (or any faster-than-walking vehicle for that matter): by owning the vehicle and/or controlling access, the owner has the highest level of control over his/her mobility. The vehicle enables feelings of agency and independence. With public transport, travelers place themselves in the hands of the public transportation system. 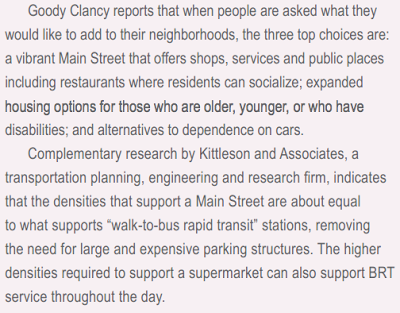 What they give up in spontaneity (assuming they had the option in the first place: the ability to drive is modulated by economic situation, age, and/or disability) they gain in mobility and access. From page 74 of the Are we there yet? report by Reconnecting America. Is it so hard to imagine that, by enabling or enhancing access to food markets, employers, educational institutions, social networks and recreational venues, public transport enhances a sense of connectedness, thankfulness, and belonging among its users?